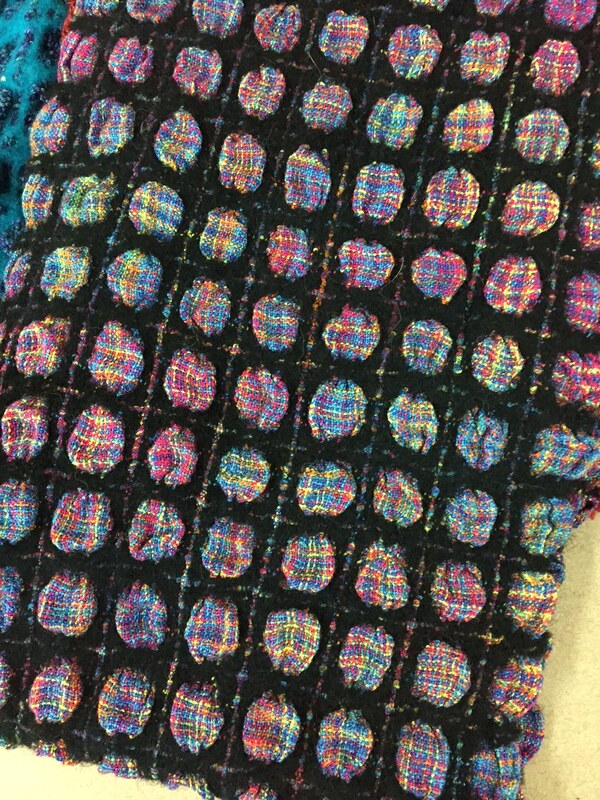 A favorite Weavers Guild activity is “Show and Tell” – whether it is at a study group meeting or a full Guild meeting. Weavers love showing new work in a variety of techniques to an appreciative, knowledgeable audience. 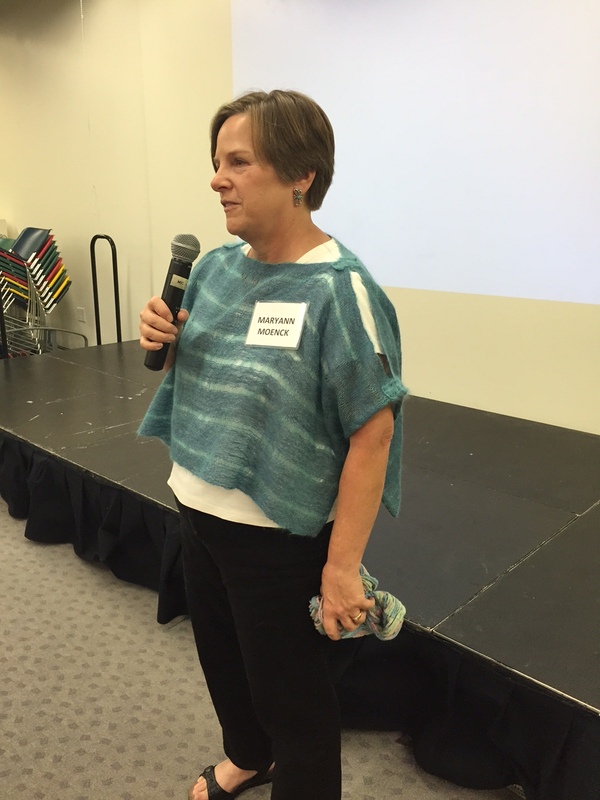 The first item shown at our recent Weavers Guild meeting was a beautiful gauzy short wool tunic woven by Maryann Moenck. Since I was leading the show and tell, I didn’t get photos of the other items, but I remember some beautiful blue yarn dyed by Karen Mallin, who said that her first experiments with woad started with a dyepot that dyed her utensils, but not her yarn! MaryAnn Olme showed a pillow that was displayed at the State Fair, zipper side out. This weekend I was lucky enough to see another weaver show and tell. I was in Denver, and it coincided with the monthly meeting of the Rocky Mountain Weavers Guild. Their meeting, on Saturday morning, led off with a discussion of their budget, and then Show and Tell before the program. Paul Tracy showed two rugs, woven from drafts in a book by Rachel Brown. 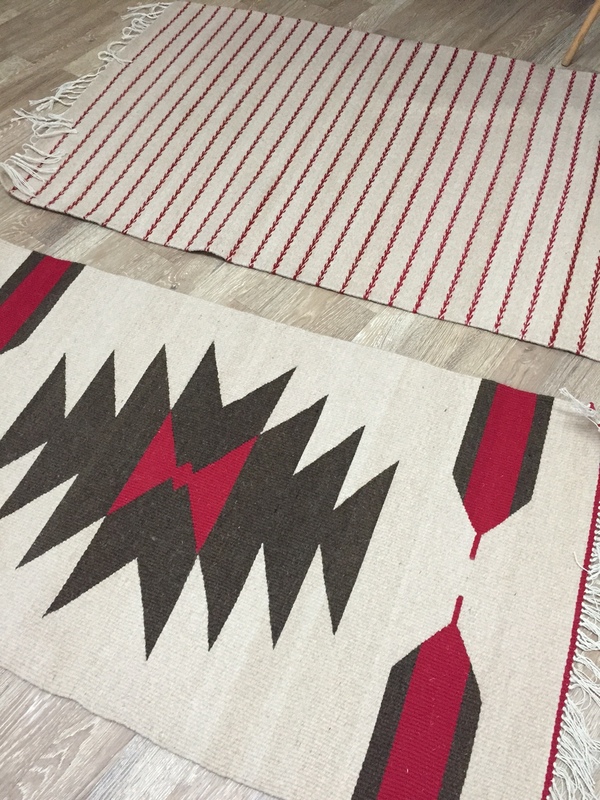 The striped one was billed as a rug that took five pounds of wool and one day to weave. Ha! noted Paul – it took twelve pounds and weaving it one day didn’t happen. 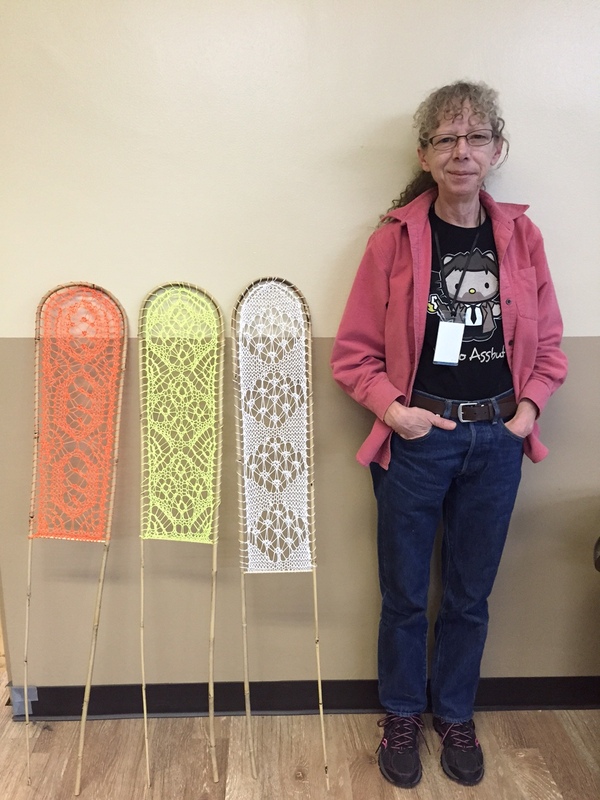 Frankie Franklin made some cool lace knit trellises using gardening materials from the hardware store. 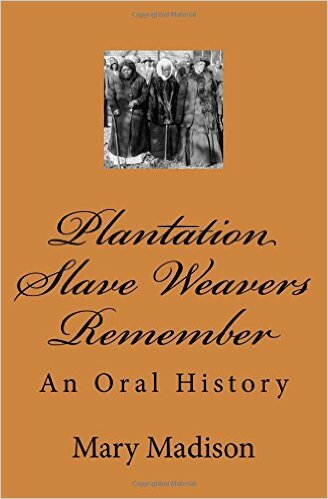 Mary Madisen was pleased to report that her book, Plantation Slave Weavers Remember, has come out. Mary combed through 10,000 pages of interviews done with former slaves and the children of slaves to find references to weaving and textile work. She twas amazed at the depth of the information and would like to work with the interviews further. In particular, she was struck by the descriptions of slave children’s lives. Edna Devai showed beautiful linen napkins; she reached her long-time goal of weaving a set of twelve. When she displayed the beautiful matching runner, someone joked about not serving red wine when using it. Edna noted that linen is known for not taking dye very well, and that if you handle the spot promptly, it is not a problem. The Rocky Mountain Weavers Guild has a strong contingent of dyers, and several people displayed the fruits of their natural material dyeing this summer. The group manages the the Janice Ford Memorial Natural Dye Garden as part of the Denver Botanical Gardens. The program by Marcia Kosmerchock, “Twist, Stretch, and Shrink,“ was in essence a longer show and tell session, in which Marcia described her ten years of experimentation with collapse weaves and differential shrinkage. Tables full of examples were set out, and many garments hung nearby. She was funny and inspiring, and started out by saying that she loves experimenting with differential shrinkage and using elastic yarns. “Sometimes it’s pure magic. Sometimes it’s a failure.” She covered a lot of information and covered a lot of ground on the stage, moving to one side or another to pick up a scarf or sample to show us, A few times she held them aloft and then casually dropped them to the floor, moving quickly to her next slide. Audience members in the front gasped, and and leapt up to return them to the tables. It was fun to visit another guild and compare the structure of the meeting and the organization to ours. The meeting was held in a church in Englewood where the Guild rents space. They pay a person $50 per meeting to come in and set up the chairs and tables, and to take them down. 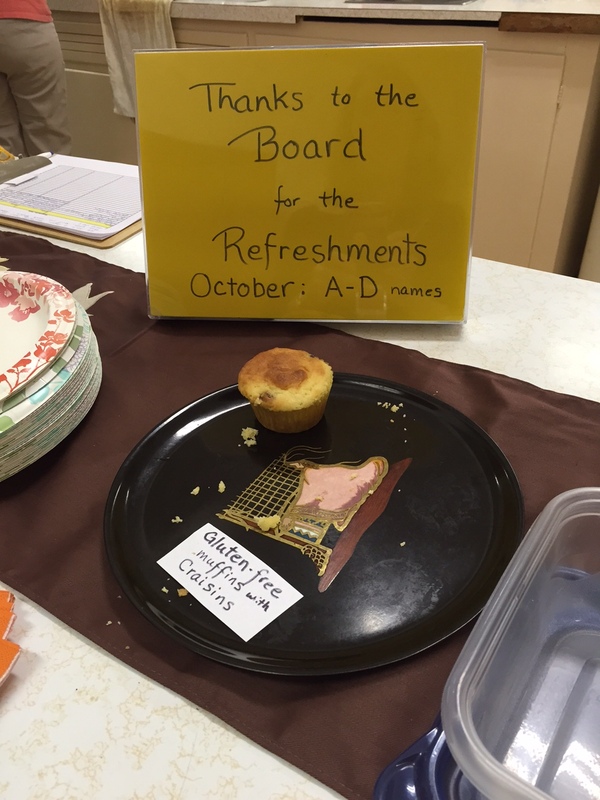 There is food, or course, this month provided by board members. The group deals with many of the same issues we do. 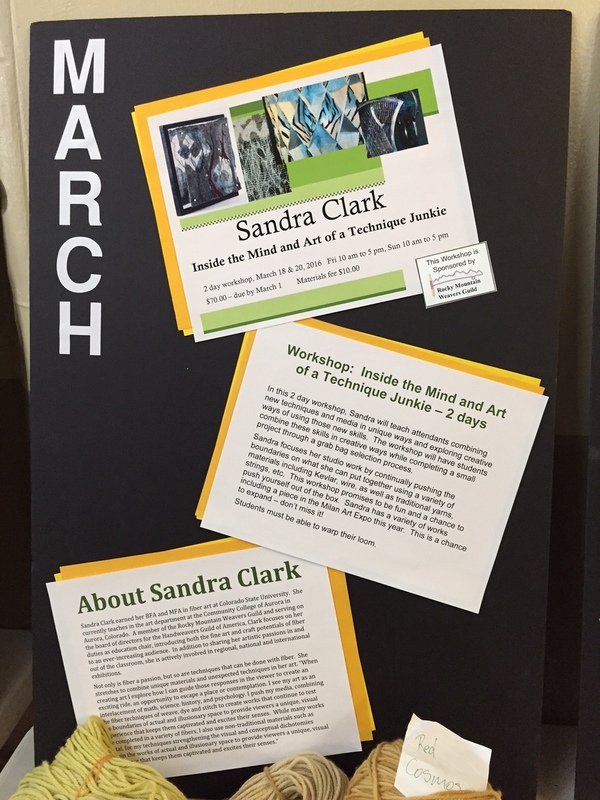 There were admonishments to sign up for the visiting artist workshop next month – support your guild! They also need a president-elect. Their annual sale is coming up and they were encouraging members to sell their weaving. They have a newsletter with a clever title, “The Shuttle Scuttle.” They are starting to organize their archives. Although some members made announcements during the meeting, there is also an announcement board at the back of the room. Also at the back of the room were poster boards showing the plans for upcoming member meetings. I noticed that the December meeting is just like ours, a member pot luck. There are many differences between our guilds. The Weavers Guild of Minnesota is much larger. For example, they were happy to clear $69 on their fiber sale last year, and our guild makes thousands. Yet it felt like I was in a room of kindred spirits, both in terms of passion for weaving and the desire to support a thriving guild.